Leo Lacey played for London Irish in the late fifties, appearing for the first’s, the Geese, and ended up playing for the Wanderers in the Seventies. He also played for Rosslyn Park, Bristol, Bath, Surrey, a few clubs abroad and for Nigeria. Now aged 77 he lives in Northern China with his wife Zhaoli and kindly agreed to answer my questions when I met him in Australia recently. Date and place of birth? When start to play to rugby? Did you always play prop? When did you join London Irish and how many games did you play for them? How many points do you score? How did you find out that you had been picked to play? Did you ever play at the Rectory Field, Blackheath? What do you remember of Fitzy's bar? What was your favorite away ground? Who did you consider the best player you played with at London Irish? Who were the characters at London Irish? How good was the LI XV in those days? Do you miss London Irish? Do you have a favourite stories from your playing days? Did you go on any overseas tours with London Irish? How difficult was it for London Irish to field a First team on Inter Provincial weekends? How long did you play for London Irish? What sides did you play for? Principally the Wild Geese, for the First if they were really desperate and for the Wanderers in my dotage. What other clubs did you play for? 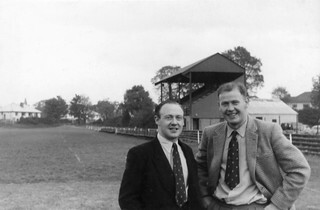 Late 1953 Returned to Rosslyn Park, but sent to work in Bristol. 1957/8 In Lagos, Nigeria, playing for the Ikoyi club. 1968 Moved to Melbourne and played prop for a club called Powerhouse. You where awarded an Honours Tie when was this? In 1994, final game that I played, in Beijing, was really just a combined side of Australian and New Zealand guys got together by a lad from the Australian Embassy - it wasn't an Embassy side as such. I was 63 or 64 then and next day I felt as if I would never walk again so I said Amen. Did you play County Rugby? How different was the standard of County rugby compared to club rugby? Did you win any other Honours? Who was the biggest influence on our rugby career? Do I still watch rugby? When were you last at a London Irish game? Do you prefer the rugby today or when you played? Civil engineering 1950 - 2001 with periods in Kuwait, Nigeria, Norway, Holland, Australia, Bougainville, Singapore, Germany, Denmark, the Ukraine and China. You must appreciate there were four props at LI in my days. In order of skill they were JLA Brown, Bish Gallagher, Tom Tranter and myself. If I ever made it into the first it was solely due to injury or other non-availability. I wasn't really very good - just lucky to play with other people who were more skilful than me. Last edited by PaulHP on Fri Mar 07, 2008 9:20 pm, edited 4 times in total. when you met him in Australia recently? Paul "Whicker" HP, is it? I think that has to be just about the best interview you've done...! PB: "DP hope you don't mind but I'm just nipping off to Australia as there is a London Irish player from the 1950's I want to interview. DP: That's fine, go business class though instead of First will you. PB: Ok, see you in about 3-weeks"
A great interview, thought might be given to publishing these interviews as a fund raiser. Maybe OR could advise on that. Business class? No, we're too cheap for that, we both went economy. I wish. A very, very good interview! As always, great stuff on these interviews. Worse still, client has economy only policy on any flights less that 8 hours but agrees to upgrade external adviser but not own staff member. Situation redeemed when client told it was important that clients representative and external adviser had the opportunity for discusion on the flight (the fact that the flight departed Heathrow at 2230 didn't seem to matter!). Now that scenario would have made the guy suicidal from his sulky state. Just ten minutes ago I went to our mailbox and there was a parcel awaiting me from you. Thank you very much. I will read the print off it. And, my memory has chimed in. The First team captain that I liked so much was John McKenna. I can't think why I thought his name began with E. But that's old age for you. 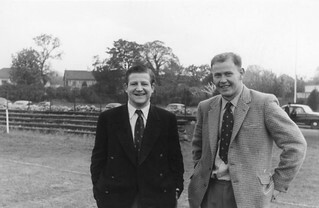 John and his mate Mick Doyle, both dentists' were great advocates of Sunday rugby - during the period I played at the Irish there were Sunday games almost every week, there was even a sort of Sunday league around London and I rather think that the team photo that I have got is one of these Sunday sides. 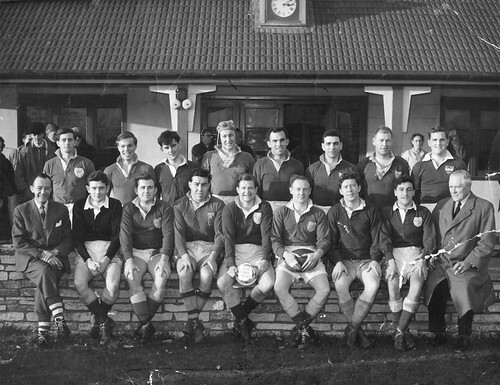 They used to be a great mixture with people from almost every team playing together - just people who loved rugby. Well, I've read through the period from 1950 to the end of the 70's and there are a number more names that ring a bell to me. But first I'm happy to see that my memory was finally right about John McKenna and see that it was 64/65 that he was captain. He and Willie Doyle (I got that wrong) were inseperable and were the two regular loose forwards in the first. My memory says that both were dentists but I may be wrong but anyway both were keen members of the Sunday side as well. As for the lad whose face I remember on the pictures that you forwarded - I think now that it must be Johnnie Bamber. Whoever he was he too was someone who really loved the game and he didn't seem to care who he turned out for. Who else - well, of course, a couple of other props, Tommy Joy, a hard man, and Simon Jones. Then I loved to see the two pictures of Fitzie and was interested to learn how John Brown came to join the Irish - he never told me that. Good ,too ,to be reminded of the Duke of Yorks although really at the time I went there it was a bit of a waste of time but still it was good crack. Murphy-O'Connor was known to everyone but the name that really pleased me to see is that of Dave Craig. He really worked hard to make London Irish a good club . Friday night after friday night he would be ringing up "you've got a card for so and so but we need you to go with someone else". He was truly a great guy. The other name that amused me was Brendan Quirke. I played alongside him on a number of occasions and he was a great buddy of Paul Whittaker, who was one of my mates (despite being a back). Paul often told me tales about Brendan, who was a lawyer, and who apparently had all the top jockeys from the Epsom stables on his books. In the bar after a game Brendan was even funnier than he used to be on the microphone . One thing in particular I do agree with is that the period when I was playing was an awful lot of fun. Drink driving was considered totally normal and I can remember waking up one sunday and going out to my motorbike and wondering why it had a flat on the rim of both wheels. That afternoon, going to Sunbury on it, for a game to sweat the beer out, I saw a roundabout with a rut right across it and realised that I must have just gone straight over it the night before on my way back from Fitz's bar. I had absolutely no memory of how I had got home at all, let alone remember going over the roundabout. I also remember seeing Tom Reid at Sunbury but I never played in the same side as him. A big man in those days - which were before Wade Dooley came along and second-rowers had to be 6'6" at least. The couple of times that I was at Fitz's when Richard Harris was there he was with his wife, who was Lord somebody or other's daughter, and whilst he had a good gargle, he behaved himself. One last one. Johnnie Johnson. He was a prop for the Met Police and played for Middlesex. He was a darned good prop too. When he stopped playing he took up referreeing and (amazingly for a prop) he knew the rules and was a good ref. He stopped me once on his police Triumph for doing something a bit batty and when he saw me he recognised me and said "Don't do that again, you silly bugger' and that was the end of that. I have just found the following obituary for Leo on-line. R.I.P. Leo.